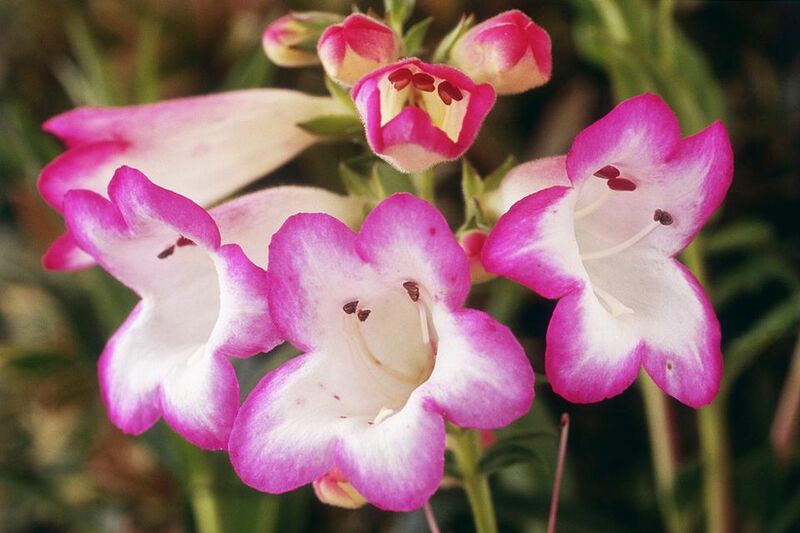 Have you ever heard of the flowering penstemon? If not, don’t tell members of the American Penstemon Society. Yes, there is an organization dedicated to cultivating, propagating, and identifying species of this hardy native perennial. If you still aren't sure about the beardtongue flower, perhaps the two men charged with felony theft in an attempt to steal 600 pounds of Palmer’s penstemon seedpods from Utah’s Zion National Park could tell you more about the value of this little plant. These men may regret exchanging their freedom for several bags of seed worth $25,000, but you won’t need to go to such extremes to grow the beardtongue flower in your landscape. The plantain family (Plantaginaceae) gifts us with some wonderful ornamental flowering plants, including snapdragons, foxglove, and the valuable Penstemon genus, which contains more than 250 beardtongue species ready to grow in your garden. Penstemon plants are herbaceous perennials that feature lance-shaped foliage and spikes of tubular flowers. Flower colors include pink, red, white, purple, or rarely yellow. The nickname of bearded tongue refers to the pollen-free stamen that protrudes from the flower, resembling a bearded iris in this aspect. Botanists often refer to the appearance of this beard when distinguishing among penstemon species. Are Penstemons Right for Your Garden? Gardeners in USDA growing zones 3-9 have the option to try penstemons, although some varieties may only be hardy to zones 4 or 5. Plants typically bloom in early summer, filling that gap between the end of spring bulbs and the maturing of summer flowers like coneflowers, yarrow, and coreopsis. Most penstemons are one to three feet tall, but the Palmer’s penstemon can grow up to six feet, giving you options for the middle and back of the border. Penstemons are easy to start from seed, which is just as well, as many of the species are short-lived perennials. Seeds may germinate better after a period of aging, mimicking their conditions in the wild, so you can store seed for several years before planting. If you sow the seeds in the garden, do so in autumn, to allow a natural stratification period. Alternatively, you can stratify the seeds in the refrigerator for three months if you plan to start them indoors. If you purchase penstemon seeds, be sure to check the growing zone, as tender varieties like the ‘Tubular Bells’ series are often sold alongside the hardy perennial types. Penstemons don’t compete well with other plants, so give them plenty of space in the garden. Plant penstemons in the spring, and choose a site with full sun and very well draining soil. These plants are prairie natives and prefer rocky or sandy lean soil types over rich garden loam. It’s OK to amend the soil with compost to achieve proper tilth but avoid manure applications. Keep the penstemon flowerbed weeded regularly. A three-inch layer of organic mulch can help to control weeds, and rock mulch is also a suitable choice. Penstemons tolerate drought, but one inch of water per week in the summer will keep plants vigorous and promote better blooming. You can cut the spent flower stems back after blooming to help plants look tidy. Penstemons don't suffer from too many insect problems, but slugs and snails may snack on leaves, especially in damp or shady areas. Sprinkle diatomaceous earth around plants to deter gnawing gastropods, and set out beer traps to catch any stragglers. Penstemon plants are usually disease-free when given the proper culture of full sun and good drainage. Gardeners with heavy clay may lose plants to root rot, especially in areas with heavy snow that experience a long spring thaw. In Southern gardens, plants that don't have adequate soil drainage or are planted too closely together may succumb to powdery mildew or Southern blight, a fungal disease also known as white mold. Fungicide sprays treat symptoms but not the cause, so lighten your heavy soils with compost, or plant penstemons in raised beds to add air circulation to plant roots. Penstemon plants look best in groups of at least three to five plants. Is your planting area small? Include the smaller varieties of penstemon in the rock garden. Plant tall penstemon types in the middle or back of the sunny mixed perennial border. Penstemon flowers are a valuable source of nectar for bees, butterflies, and hummingbirds in the wildflower garden. Penstemon flowers also make good cut flowers, although most people don’t think them as bouquet candidates. The good news for those who prefer not to cut is that browsing deer avoid penstemon plants. 'Dark Towers' is similar to Husker Red, but with pale pink flowers and darker foliage. Topping out just shy of 12 inches, 'Elfin Pink' is a good rock garden plant. "Husker Red' is perhaps the most well-known variety, due to being named perennial plant of the year in 1996. Plants feature reddish-purple foliage and white flowers. The reddish-orange flowers of 'Jingle Bells' are a beacon to hummingbirds. The 'Piña Colada' series features blue, rose, or white flowers on compact plants. Monrovia’s successful introduction 'Red Riding Hood' has red flowers and an upright growth habit.